Recently in Des Moines, Iowa, a teenaged female was pulled over by a white unmarked car that had a black push bumper and big red and blue emergency lights on top. 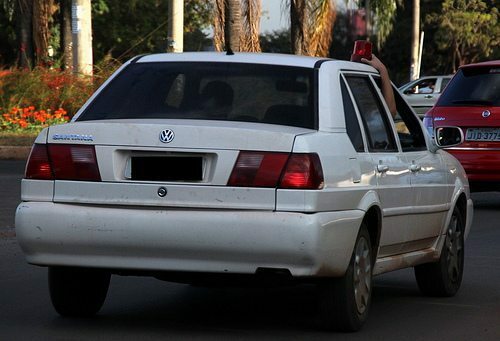 A man came to her window and asked her to exit the vehicle so that he could search her car. She was suspicious of the man’s behavior and didn’t get out of her car; instead, she told him that she was going to call 9-1-1 to ask for another officer. When she did, the man fled. It can be difficult to tell the difference between an unmarked police car and a civilian using police paraphernalia. How can you tell the difference? What should you do if you’re not sure? We’ve gathered some tips on what to do if you ever find yourself being pulled over by an unmarked police car. This list isn’t in chronological order, and chances are you will be doing many of these tips at the same time. If you are concerned, do not stop. Signal to the car to acknowledge his request by slowing down a bit and putting your hazards on. Drive to the nearest public place (a gas station that’s open late, a police station, a mall parking lot) and then stop. If you are in a deserted area, look for a house that is obviously occupied and pull into the driveway. Use your cell phone. Dial 9-1-1 to talk to the dispatcher, and let them know that you aren’t sure if a legitimate police officer is pulling you over. Give your location and have them guide you. You can always request that a marked police car meet you. Be safe. At all times, be safe. When you stop, keep your doors locked and only crack your window. Ask to see his badge. If the person starts to act odd when you ask to see his ID (threatening you, behaving in a non-professional manner, pounding on your door, etc. ), tell him that you are uncomfortable and that you want to go to the nearest police station. Use your best judgment–if the person is pounding on your door and threatening you, chances are he isn’t a real police officer. Get out of there. Report. The person might get upset or spooked when you tell him you are calling 9-1-1 to check on his credentials. If he flees, do not follow him. Instead, try to get a license plate, a good look at the car, and a good look at the person. Report the incident to the police. By letting law enforcement know that there is an imposter, you might be able to save someone else from being robbed or seriously injured. Remember, it’s better to be safe than sorry. An actual police officer will understand your hesitations to pull over in an unlit place without many other people around.